There’s some arguments that come around and you think ‘really? we’re still talking about this?’ but also you’re not really surprised. So when it was annoucned Tom Hiddleston was teaming up with Kenneth Brannagh for a production of Hamlet, it was inevitable that the cries of ‘Silly fangirls’ began. Once again we’re confronted with comments that girls ‘Only want to see it because he’s in it’ and ‘Aren’t interested in the play’. And because I am a woman, therefore incapable of thinking of him other than in terms of his looks….here he above with a cat looking cute. But just like Mr H there is both petting a cat, reading a newspaper and looking brooding, I’d like to point out that it’s entierly possible to be interested in more than one aspect of a thing at the same time. And secondly I say so what the audience is just there to look at his cheekbones? I don’t have a horse in this race. I think Hiddles is a damn good actor, and has very nice cheekbones. He’s not an actor I’m personally a ‘fangirl’ of but I have been, and am a ‘fan’ of actors, and have seen shows purely because they are in them. I’m not ashamed of that, but I am sick of being dismissed as a ‘silly fangirl’ for buying those tickets. As if somehow, somewhere there’s someone more ‘worthy’ of them than me. In this very specific instance (and indeed most instances of ‘celebrity’ casting) the use of the celebrity is to draw audiences. In the Hiddleston case, it’s a fundraiser so the idea is to create as much attention as possible to, um raise funds! But even in say the cast of the RSC casting, David Tennant at the height of his Dr Who mania, the point was, yes, funny enough to sell tickets. And who wants tickets? fans of the actor. And what happens when you get a popular actor into a theatre? tickets sell, people see the show. Which is what we all want no? Ah well no, some people think that theatre should only be for an elite few who have somehow ‘proven’ they are worthy to be there. These are the same kinds of people usually who bang on about how ‘awful’ it is that people aren’t interested in ‘the arts’ anymore, but equally swiftly condem new audiences who dare to come to the theatre because a ‘bloke off the telly’ is in it. I see many, many shows for many, many reasons. These reasons vary widely from ‘I really love this playwright’ to ‘I like this theatre company’ to ‘A-friend-of-mine-did-something-to-do-with-it’ to ‘My friends want to see it’ and yes, ‘I really like that actor.’ Never ever have I been stopped at entrance to ask why, nor at the exit to prove my ‘legitimate’ enjoyment of the play. Let’s not forget also that this is also insulting to the actors. The idea that because they’ve gained some public attention in film or TV they themselves are somehow ‘lesser’. Hiddleston trained at RADA, which is why he’s giving the performance there as a fundraiser. He, David Tennant, Benedict Cumberbatch, Andrew Scott, Oscar Issacs (to run through the recent ‘famous’ Hamlets) are all trained experienced stage actors who also incidentally have had commercial (and critical) success that has brought them to a wider audience. It’s insulting to the talents of these actors to suggest they are getting parts and drawing audiences simply because of how they look. And it’s insulting to audiences to say they only follow these actors because of how they look. Trust me as a fangirl when I say nothing will get you through watching every god-awful film an actor makes in their career if they don’t have the talent to keep your attention. And as a theatre person, trust me when I say, nobody is that pretty that they can carry an entire show without any acting ability. They’d soon get found out. Because that’s the thing such claims refuse to see, that a person going to a play for, a Hiddleston, say, can also enjoy the play and (shock horror) be an intelligent human entity capable of making informed reflective thoughts on things about said play. But you know what, it also doesn’t matter if they don’t. So what if they go, enjoy looking at his cheekbones for 3 hours, and leave happy. They got what they wanted, they aren’t bothering anyone except some high minded cultural gatekeepers. But shall I tell you what usually happens when people seek out theatre for actors? if it’s good theatre, they enjoy it, next time he or she does theatre, they’ll see it again. And if they really enjoy it…they might even see other theatre. They might even have such a transformative experience seeing someone they admire, who is good at their craft, that they’ll properly fall in love with theatre and be as devoted a fan of the art form that they become a -wait for it- theatre fan. I didn’t go to the theatre as a kid. It just wasn’t something we did. As a teen I was obsessed with Gillian Anderson (still am) and I begged to see her when she did a play. My long-suffering Mother relented and off we trotted to London. It was, as I said above, transformative for me. We sat 3 rows from the front, and I was transfixed. My copy of the play is still covered with detailed pencil scribbles I made on the way home detailing bits of the production I could remember. I became a theatre fan on that day. That theatre was packed out with X Files fans. Some of whom maybe never went to the theatre again, but at least one- me- became a life long fan. And it became my life’s work. That’s right it’s *gasp* a “famous” and “hot” actor in a play. Now admittedly I did not book to see this play because Andrew Garfield is in it. I booked to see it because…well I have a PhD in it. But I know people DID book the play because they are a fan of Andrew Garfield and you know what as Dr-Angels-in- America I’m thrilled. When I was at the NT on Saturday there were lots of young girls. Probably no older than 20. They are younger than the play. They have no concept of the time it’s set in, what happened. But they’ve just spent 8 hours being immersed in that world. So what if they went because they like the famous actor in the play? and you know what the ‘famous’ ‘hot’ actor is a bloody good actor. Actually that’s not even close to good enough to describe what he does. As are the rest of the cast. So a group of teenage girls went to see him, what they ended up seeing what a masterclass in theatre at it’s finest. Someone please explain to me how that’s a bad thing. Also they have just as much right as anyone else does to buy that ticket. It’s as simple as that. There’s not an entry exam. And even so, I am no better than them. I have a PhD in this play. It doesn’t get more ‘highbrow’ (wanker) than that. 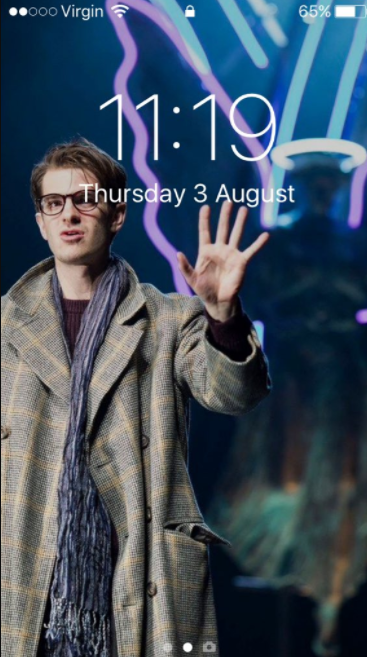 But I’ve still made Andrew Garfield my screen saver. I’m fangirling him in a play admittedly (Don’t tell him but I’ve never seen Spider man) but it’s the same bloody thing! I’m not better or worse. I’m a total, Angels in America NT 2017 production fangirl. It’s embarrassing in some ways because I’m SUPPOSED to be a professional about this, but I have silly “girly” moments (Look, I am a woman, and James McArdle is….well him, I can’t help it, it’s almost enough to turn a gal straight). I have that obsessive fangirl gene and weirdly it’s what actually made my PhD happen. Fangriling is simply extremely focused attention on a subject. I did that for 4 years and called it a PhD. No different. And finally, we shouldn’t assume that ‘Fangirls’ are only interested in an actor’s alleged attractiveness. Yes that might play a part (so what, we’re all human again) but nobody sticks around for just ‘pretty’ nobody pays out often 100s of pounds to travel and see that actor on stage just for ‘pretty’. They admire that actor for their work, they pledge themselves to supporting them. Tell me again how that’s any different from a person who pays out their annual membership to the RSC or NT? because I can’t quite see the distinction. And let’s not forget it’s often a sexist connotation. The idea of silly screaming fangirls. The idea they will ‘misbehave’ and ‘spoil’ things for everyone. The idea that they reduce their subject to nothing more than something nice to look at. Take a long hard look at yourself if you find yourself saying that. And think really, do I honestly believe that women, are incapable of anything more? As for not being able to behave and ruining an experience. Now there’s always the odd one granted, but again I fail to see a correlation between ‘Likes the actor on stage’ and ‘incapable of sitting quietly and watching the actor on stage’. Becasue to be honest, I have never seen attention so rapt as a true fan of an actor. And if you’ve had the misfortune to be trapped with a matinee crowd of a regional theatre, or a certain ‘high brow’ institution, you’ll know manners are not the preserve of age or circumstance. Sit me with a crowd of teen actor fans any day, they’ll sit quietly enraptured by the performance and probably have a nice chat at the interval. Unlike their more ‘high brow’ counterparts. So save me the usual whines about fangirls ruining everything, and somehow not deserving to be in the theatre. This is a benefit FOR RADA, not an audition to get in, and in general, there’s no entrance exam to buy a ticket. So I say theatre, bring me your famous actors (who we know can act) bring them to me for Hamlet, or new plays, or musicals. Because with every actor known for something else comes a fan or 10, or 100 who will see them doing something different. And if 10 in every 100 sticks around and discovers love of theatre, then we’re doing a good job. And maybe 1 in every 100 will become someone like me, and have their life utterly transformed, because they were once a fangirl, who went to the theatre.